Carriacou is a place I like to call ... "Next To Heaven"
It is our home of lovely scenery and beaches, and friendly people." 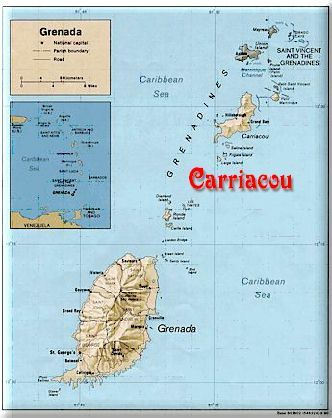 This section is an extensive and detailed information source for the beautiful and friendly island of Carriacou, Grenada, located in the Southern Caribbean of the West Indies! Here you will find photos, virtual tours, relevant news, and abundant tourist information. You will find more information below, beginning with the weather and time for Carriacou! I hope you enjoy your visit. Click here for the current time and weather for Carriacou. 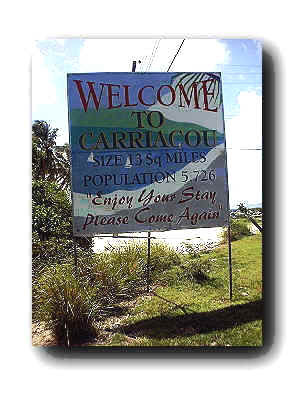 Click here for other information about Carriacou. North Latitude and 61°27'00" West Longitude. Click on date and time image for much more information! Click here if you would like to see a recent satellite image of our region. Those interested in the Robinson's work on Carriacou. Those perhaps interested in settling and living on Carriacou or the mainland of Grenada. Tourists that are interested in visiting--in my opinion--a fairly pristine, small, and gorgeous West Indian island that is located in the southern Caribbean. Walter II, and Linda are originally from West Virginia, USA. The state slogan for "Mountain State" is "...Almost Heaven." Since August 21, 1991, our family has been blessed to live on the beautiful island of Carriacou, a possession of the "Spice Island" of Grenada. I believe a good slogan for the smaller sister island of Carriacou is "...Next to Heaven." Take our Virtual Tour of Carriacou and see if you agree. The culture, like the people themselves, is a mixture of cultures from all over the world. It is obviously colored by ancient African characteristics and European traits, but the progressive nature of the population also reflects increasing American characteristics. Carriacou is a down right beautiful island with breathtaking beaches of ~14 square miles in area. The landscape varies from mountain peaks and ridges to relatively flat coastal areas. The majestic mountainous ridges capped with a clear sky depicts its volcanic geologic origin. The two highest peaks are just under 1000 feet. Available are numerous guest houses, hotels, restaurants, diving businesses, and agencies that provide tours and individual sightseeing. Many of the roads are currently being replaced with pavement that will make the island an even more desirable tourist attraction in years to come. This section is constantly being updated and expanded. Check back often to see what is new!